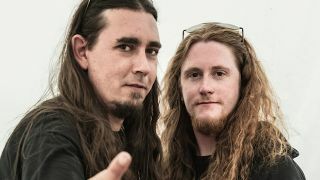 Evile have announced former Fallen Fate member Piers Donno-Fuller as their new guitarist. He replaces Ol Drake who left the Yorkshire band in 2013, leading to a period of inactivity for the metal heroes. They launched their search for a replacement in October and received hundreds of applications, but bass player Joel Graham tells TeamRock Radio’s Metal Hammer Magazine Show they opted for someone local as well as extremely talented. He also admits they did consider calling it a day when Ol Drake – brother of frontman Matt – left the band. Graham says: “We had to step back and ask what do we do from this point. We thought it would be a shame to stop it right now. We had to find the right guy, that’s taken time. I appreciate people have been waiting for news but we’ve got to spend time with this guy, get on with him, travel with him and he’s got big shoes to fill. The audition process was an enlightening experience for the band, with some of the applicants taking entirely the wrong tact. The band didn’t rush making the appointment and they won’t rush the new guy into work either, with his first gig not lined up until March next year.